The shortlist for the Wellcome Book Prize 2016 has been announced, with a strong psychological theme again running through the nominations. Celebrating the best new books that engage with any aspect of medicine, health or illness, Wellcome say that the 2016 shortlist 'showcases the breadth and depth of our encounters with medicine through six exceptional works of fiction and non-fiction'. From memoirs on addiction (The Outrun) and on the aftermath of a debilitating accident (The Last Act of Love) to studies on autism (Neurotribes) and psychosomatic illnesses (It’s All in Your Head), the non-fiction contenders reflect a broader preoccupation with the human mind, while the two works of fiction on the list comprise an immersive account of schizophrenia (Playthings) and an account of the pioneering work of an early female medic (Signs for Lost Children). 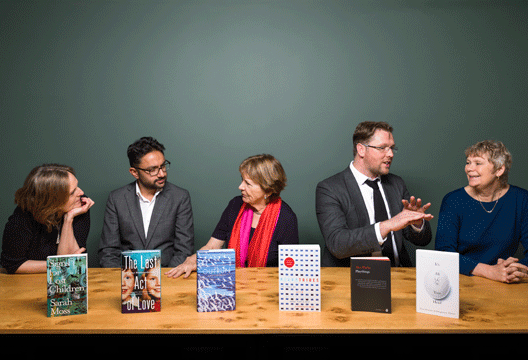 Worth £30,000, the 2016 prize is judged by a panel comprising chair Joan Bakewell; Frances Balkwill OBE, Professor of Cancer Biology at Barts Cancer Institute and an author of science books for children; writer, columnist and salonnière, Damian Barr; award-winning journalist and author, Sathnam Sanghera; and award-winning novelist, Tessa Hadley, who has exclusively provided her thoughts on the shortlist for us below. Last year’s prize was awarded to Marion Coutts for her critically lauded memoir, The Iceberg. One of the other shortlisted authors, Henry Marsh, wrote for us on psychology and his work as a brain surgeon. The winner will be announced on Monday 25 April at a special evening ceremony. Follow the Wellcome Book Prize on Twitter. All the titles on our shortlist for the Wellcome Book Prize seem to raise issues of interest to psychologists. What constitutes a self, for instance? How can the powerful, talented young woman in The Outrun be at the mercy of her compulsion to drink, why doesn’t she just ‘know better’? When she’s sober, how should she acknowledge that other part of herself, the self-destructive drunk, still there as a potential somewhere inside her? And where does a self end? Is Cathy Rentzenbrink’s brother still himself after the terrible accident in The Last Act of Love? All the personality and temperament and forms of behaviour that made him recognisable and which his family once loved him for are lost, and only his physical body remains - yet they can’t just put an end to loving him. What does it mean when a given culture sets about distinguishing sanity from madness? In Sarah Moss’s novel Signs For Lost Children the women patients in an insane asylum certainly seem to see things that aren’t there, and they can’t cope with their normal lives: but the novel makes us question whether what’s outside the asylum is any more ‘normal’. Studying the history of the diagnosis of autism in Neurotribes, we see how our categories of interpretation of mental ‘illness’ and ‘disease’ are historically and culturally produced, even if they do also relate to real things in the world. There’s no impersonal advance of pure scientific insight; the story of autism reads more like a novel, with a vivid cast of characters, power struggles, obsessions - and heroic efforts of insight. I suppose it’s true that all of the shortlisted books are about suffering – which is perhaps the deepest point intersection of mind and body, the place where we can’t escape from ourselves. Suzanne O’Sullivan in her study of psychosomatic disorders, It’s All in Your Head, makes it clear what slippery categories ‘mind’ and ‘body’ are, and how it’s impossible to separate out mind-pain from body-pain with any confident empirical certainty. But saying that these books all about suffering makes them sound dismal and sermonising and not much fun: nothing could be further from the truth (we weeded out the dismal ones!) Good writing itself is a manifestation of mind in words, needless to say – it’s the writers’ wit and irony, their intelligence and control, which make for a reader’s pleasure in all six books. Alex Pheby’s novel Playthings, about one of Freud’s patients, takes us inside the experience of delusion, turning perception upside down – but the results are darkly comical as well as tragic. We’re trained in uncertainty these days, in our culture without fixed religious or political convictions, lacking the large confidence of the past. I suppose it’s inevitable that in an era of doubt writers will turn a fascinated gaze inwards, asking how we know what we think we know, how we know what we feel, and what it means to try writing about these things, tracing mental maps of our experience in words. - Tessa Hadley is the author of four highly praised novels including Accidents in the Home, which was longlisted for the Guardian First Book Award, Everything Will Be All Right, The Master Bedroom and The London Train. She is also the author of two highly acclaimed collections of short stories, Sunstroke and Married Love. She teaches literature and creative writing at Bath Spa University. Her stories appear regularly in The New Yorker, Granta and other magazines.